Hello lovelies! 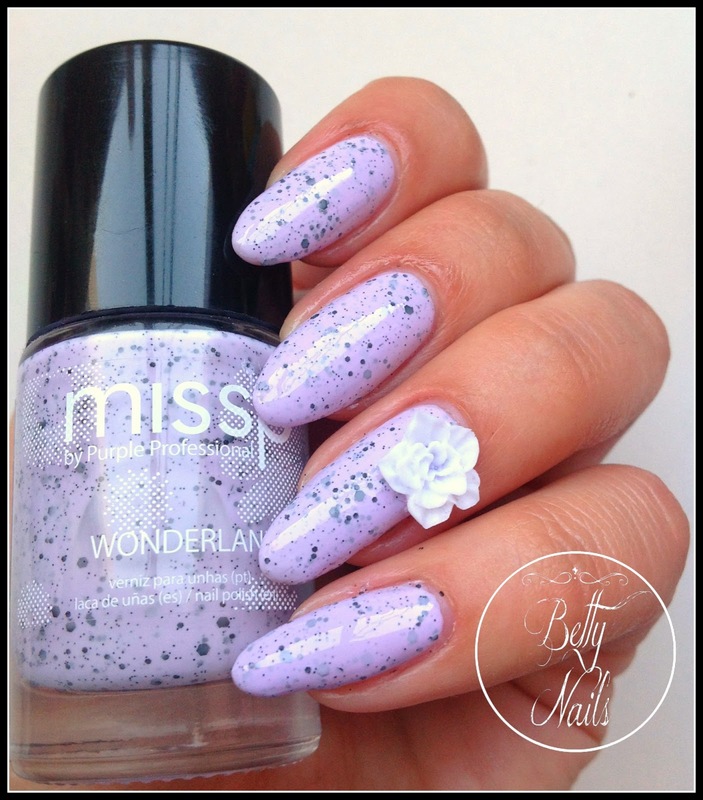 I know I should be showing you the pinks first but due to the (HUGE) amount of requests for the speckled shades of missp Wonderland Collection, I had to show them first! So... here they are, the speckled shades! Cucu Princesas! Eis os missp Speckled! Eu sei que ainda falta mostrar os cor de rosa da marca, que têm números anteriores aos Speckled, mas devido ao (ELEVADÍSSIMO) número de pedidos para ver os speckled, mostro-vos estes tons primeiro! Vamos ver? missp Speckled #20 is called Adorable and the reason is pretty obvious. This is a speckled polish because it has a creamy formula filled with multisized black glitters. The creamy base color is a very very light pink. 2 coats for full opacity, around 6 mins drying time. O missp speckled nr.20 é o Adorable e o nome é bastante obvio! O Adorable é um verniz speckled uma vez que é composto por uma fórmula cremosa repleta de glitters pretos de vários tamanhos. A cor base do Adorable é um rosa muito muito claro. Aplica-se em duas camada e seca em cerca de 6 mins. 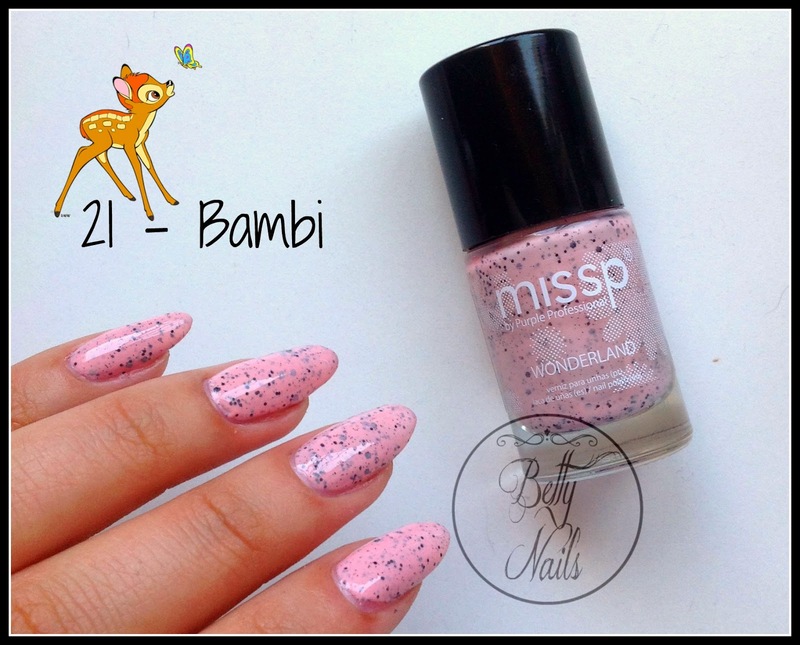 missp 21 is called bambi as it has a coral creamy base color filles with multisized black glitter. Covers the nail in 2 coats and dries in around 5-6 mins. 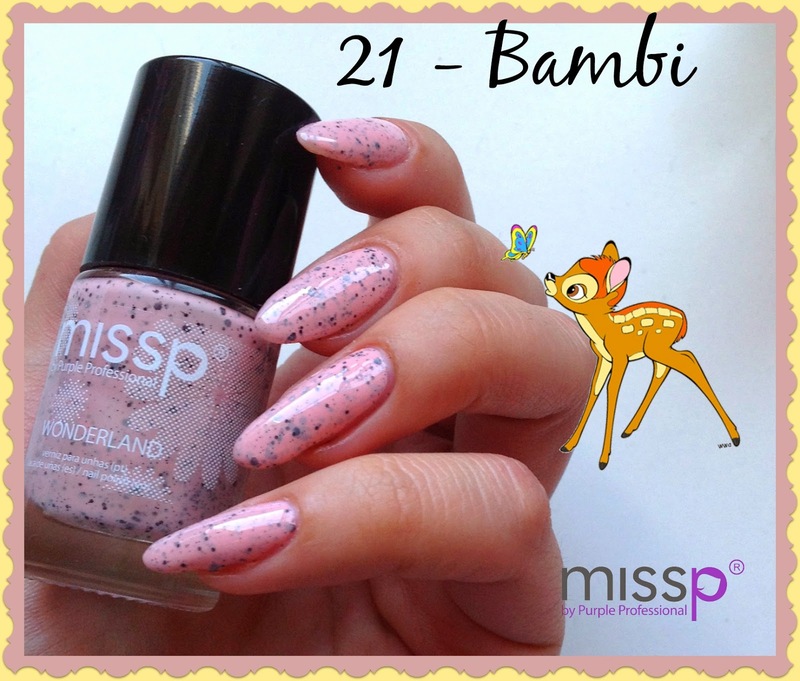 O missp 21 é um lindissimo speckled cuja cor cremosa base é um coral com um toque de rosa. Cobre a unha em 2 camadas e seca em cerca de 5-6mins. 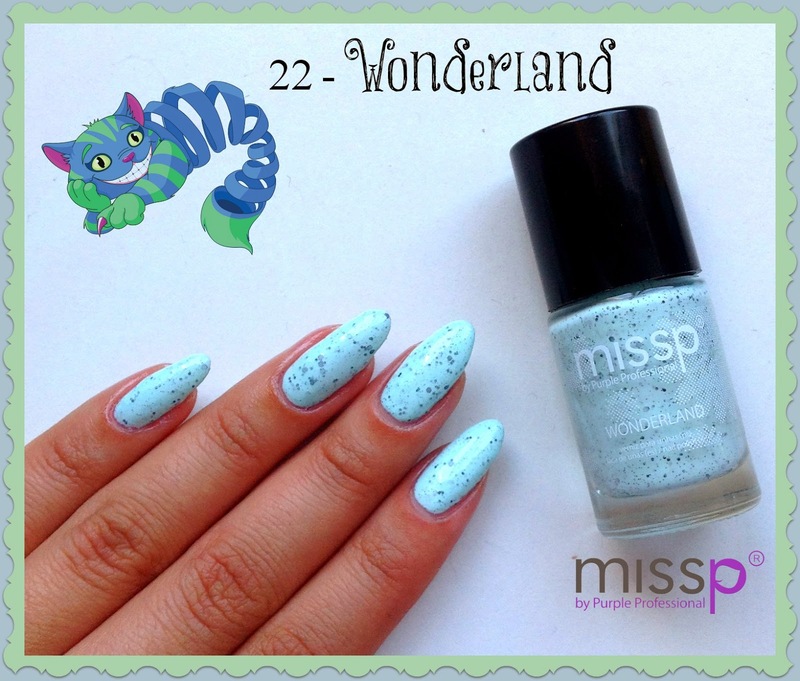 missp #22 Wonderland has the same name as the 1st collection and is a mint speckled polish. The base creamy shade is a mint green and the formula is filled with multisized black glitter. Covers the nail in 3 thin coats and dries in around 6 mins. 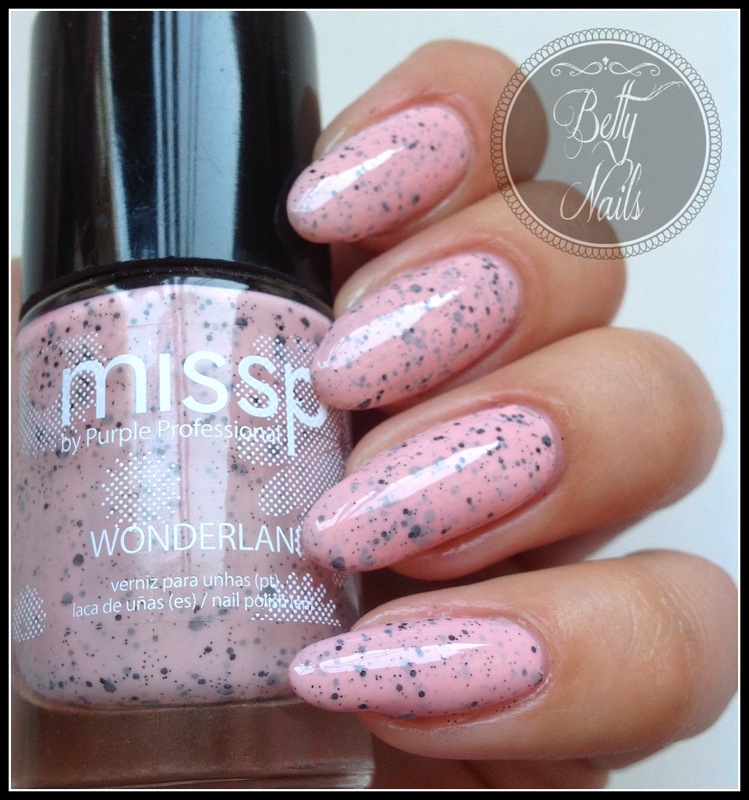 O missp 22 Wonderland tem o mesmo nome da primeira colecção da marca miss e é um verniz speckled mentol. 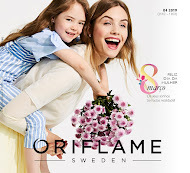 O Wonderland é um verniz cuja formula cremosa base é um verde mentol e é repleta de glitters pretos em vários tamanhos. Aplica-se em 3 finas camadas e seca em cerca de 6 mins. 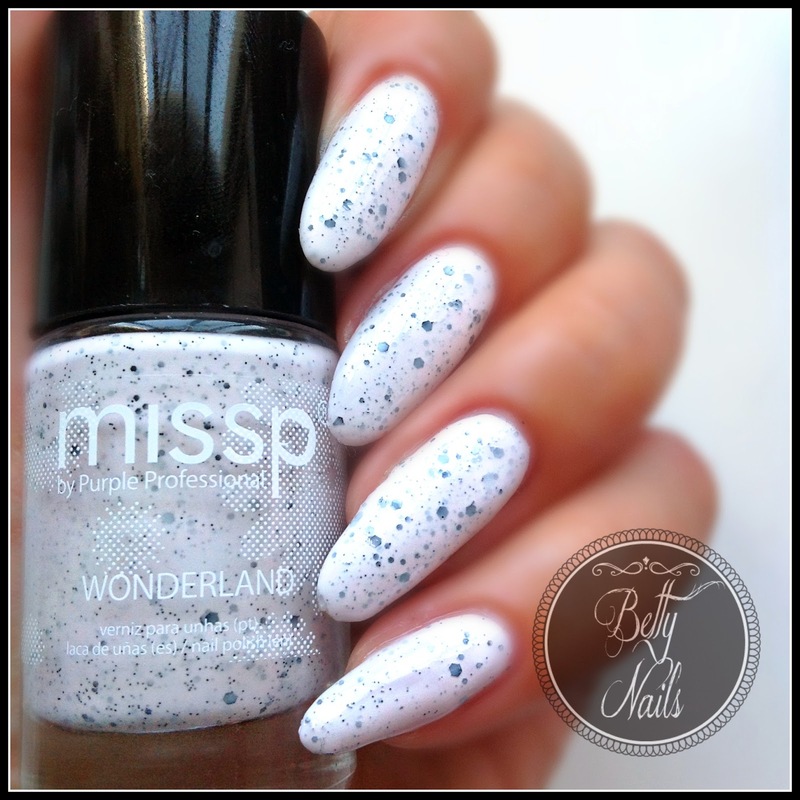 missp 23 Make a Wish is my FAVORITE speckled shade. The combination of the purple/lavender creamy base color with the multisized black glitter is just too perfect. 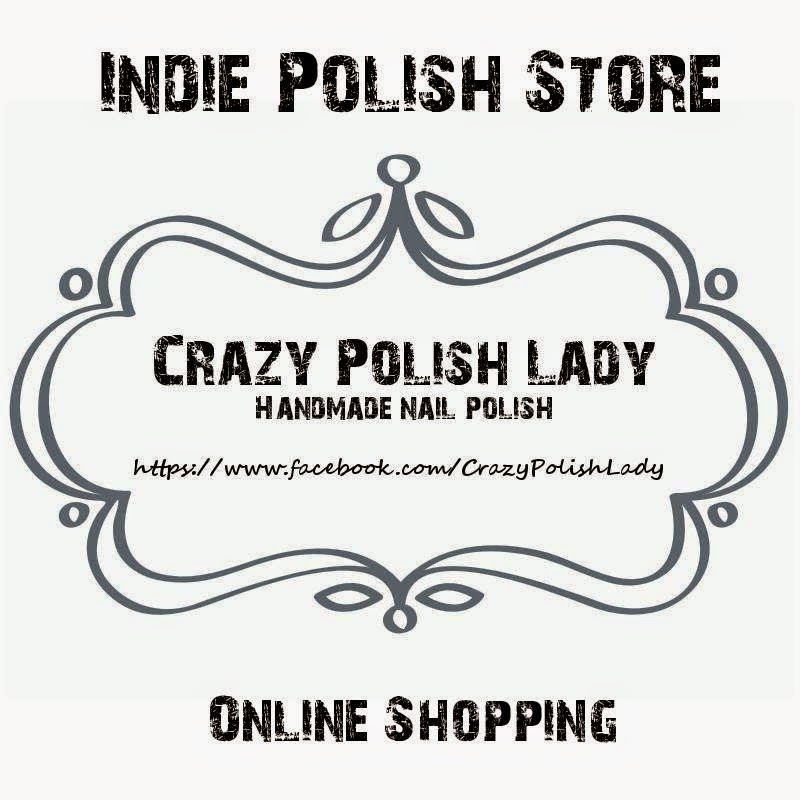 The polish covers the nail in 3 thin coats that dry in around 6 mins with a gorgeous shine! O missp 23 *Make a Wish* é o meu preferido de todos os vernizes speckled da missp. 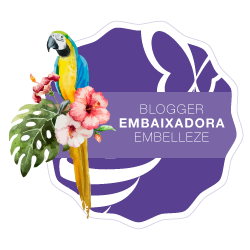 A combinação de cor cremosa base em tom de violeta com os glitter pretos de vários tamanhos é simplesmente perfeita. 3 finas camadas para opacidade total e cerca de 6 mins de tempo de secagem. O verniz seca com um brilho lindíssimo!